The upscale Le Meridien Phuket Beach Resort is only a short distance from Patong Beach and Night Market. You can relax in the gorgeous tropical swimming pools or feast on sumptuous dishes for breakfast. The beautiful white sand private beach, tropical swimming pools, and top-notch recreational facilities are some of the major highlights of this hotel. Le Meridien Phuket Beach Resort is a 5-star beach resort in Phuket that never fails to charm its guests. With a beautiful beach right in front, the resort offers a comfortable and luxurious stay for couples/honeymooners or business and family travelers looking to get away from their busy city life. It features a world-class spa and water adventures for its guests to relax their senses and have some fun. The beachfront resort also boasts of its attractive design and contemporary amenities. The luxury suites have authentic Thai accents giving an authentic feel. There is a wide range of sports and recreations facilities that the guests can partake in. 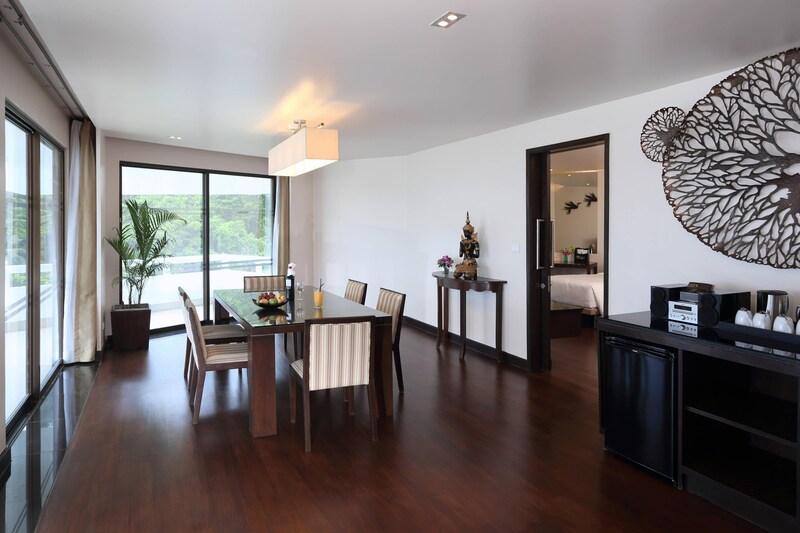 The resort is in close proximity to Patong and Karon. Business travelers can also arrange for meetings while couples can arrange their wedding ceremonies. Guests can also make use of the secluded 500 metre beach area and have picnics or romantic evenings. One can experience various water activities like swimming, diving, boating. Spa treatments and massages let one relax and rejoice. Fitness freaks can work out at the gym at the Resort. The resort keeps kids entertained with outdoor play equipment. The beach resort offers 416 rooms spread across 6 floors. The categories of the rooms include Guest Room, Deluxe Pool View, Deluxe Ocean View, Deluxe Ocean Terrace, Junior Suite, Deluxe Suite, and Grand Suite. All of them have private balconies and are designed with modern Thai-Asian decor. Guests can choose whether they want mountain, pool or ocean views. All the air conditioned rooms have complimentary wi-fi, LED TVs and designed amenities. They also have mini-bar, mini-refrigerator, hair dryer, tea and coffee maker and in-room safe. The kitchens in the rooms have table, chairs and silverware. The rooms in Le Meridien Beach Resort Phuket Thailand provide cordless phones with voicemail and electrical outlets at desk level. Le Meridien Phuket Beach Resort proudly boasts of a pool, fitness centre and full service spa. 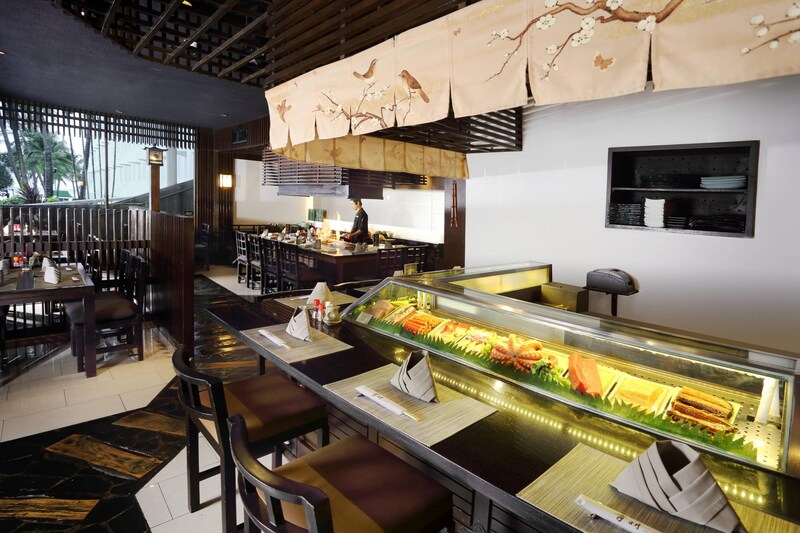 It also features restaurants and bars within the hotel premises for the convenience of the guests. Besides, the hotel maintains a travel desk, free parking area, foreign exchange counters, and 24 hour front desk. All the hotel rooms are well-fitted with latest amenities and complimentary wi-fi. The establishment also offers airport shuttle, laundry and dry cleaning services at an additional charge. Other facilities include babysitting service, concierge desk, car and limousine rental service, florist and shoeshine stand. There is also a book store and beauty shop for the guests. Meetings and weddings can be arranged as well. Le Meridien Phuket Beach Resort features 8 exceptional restaurants and bars offering a variety of delightful culinary experiences. Portofino, Ariake, Wang Warin, Latest Recipe, Pakarang Restaurant, Tonson Restaurant & Bar, La Fiamma and Beach Barbecue are the various eating options for the guests. The restaurants offer Italian, Japanese, Thai, international cuisines. The Beach Barbeque serves a variety of grilled meat and fresh seafood. La Fiamma offers pizzas while Tonson Restaurant & Bar has a great ambience with music and a collection of wines. Pakarang Restaurant has breakfast and dinner options and features live music. When it comes to catering to its guests, Le Meridien Phuket Beach Resort has it all. Amazing views of the beach, elegantly designed rooms, several themed restaurants, a host of facilities and services and friendly staff make this resort a great vacation spot. Its close proximity to the beach lets guests indulge in some adventurous water activities. Le Meridien Phuket Beach Resort is about 35 km away from Phuket International Airport. What can guests do to keep themselves engaged? There is a lot to do in and around the resort. Guests can go for a variety of water sports like boating, bowling, scuba diving, snorkelling and jogging. The hotel has a nine hole golf course on-site and a mini golf course. They can also have a sauna experience, play table tennis, get spa treatments, swim in the pool or work out at the gym. Yes, the rooms in Le Meridien Beach Resort Phuket Thailand have a mini-fridge. Yes, the resort provides special babysitting services. With the beach right in front of the resort, guests will surely enjoy their stay at Le Meridien Phuket Beach Resort. It provides the epitome of comfort and luxury, being part of the Marriot hotel chain. When it comes to catering to its guests, the resort leaves no stone unturned. Guests can make use of the plethora of facilities for all kinds of requirements. The full service spa provides ultimate relaxation after a long day of exploring the city. Families traveling with kids can rest assured that their children will not get board. They provide outdoor play equipment for kids, an indoor play area, board games and puzzles along with children television networks. Parents can also avail babysitting services, leaving their children in the care of the hotel staff. 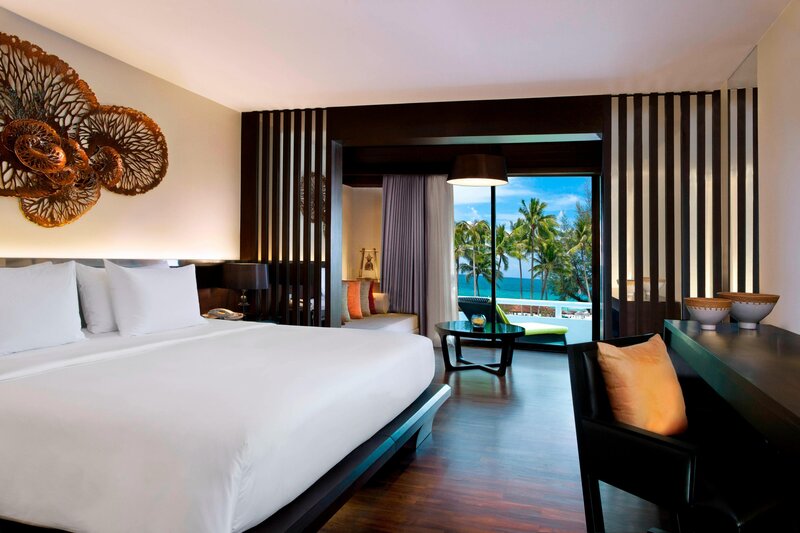 Le Meridien Phuket Beach Resort can also arrange for meetings and events in their 8 huge rooms. Couples can organise their wedding ceremonies here as well. The resorts location close to several tourist attractions, along with the countless amenities and facilities, make it an ideal vacation spot.